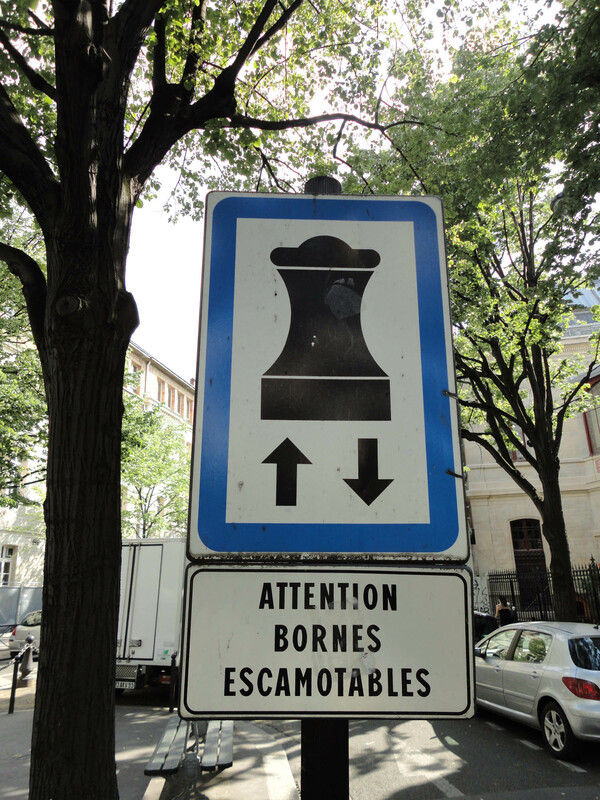 Turns out it’s an indicator of nearby pylons that raise up from the pavement to prevent cars from parking there. Sometimes the real explanation behind things is such a letdown! “Smoking severely damages the health of you and your entourage”. Well jeez, who doesn’t want to be the cool guy with a freakin’ entourage? I almost want to light one up now. 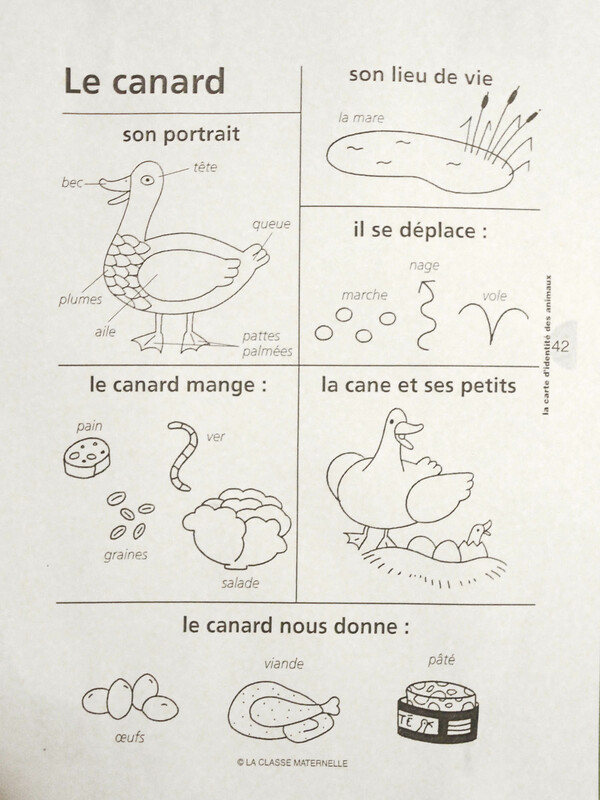 To finish on a lighter note, the bottom of a child’s worksheet lists what a duck gives us: eggs, meat, and…pâté?! There’s something fantastically French about teaching a 5 year-old about pâté. To be fair this product should probably have a graphic label or two showing how the ducks are treated beforehand, but you have to draw the line somewhere I guess. Besides, I could never give up my duck liver addiction, as my pâté entourage is just way too cool. Thanks Heather! Good question regarding my proximity to so many cigarette packs–I came across them in the apartment of one of my employers. Thanks for adding to the duck products observations, funny stuff! Sorry to disapoint you, you maybe know it already, but the “General Dream” was originally “Grêve Générale”, General Strike . 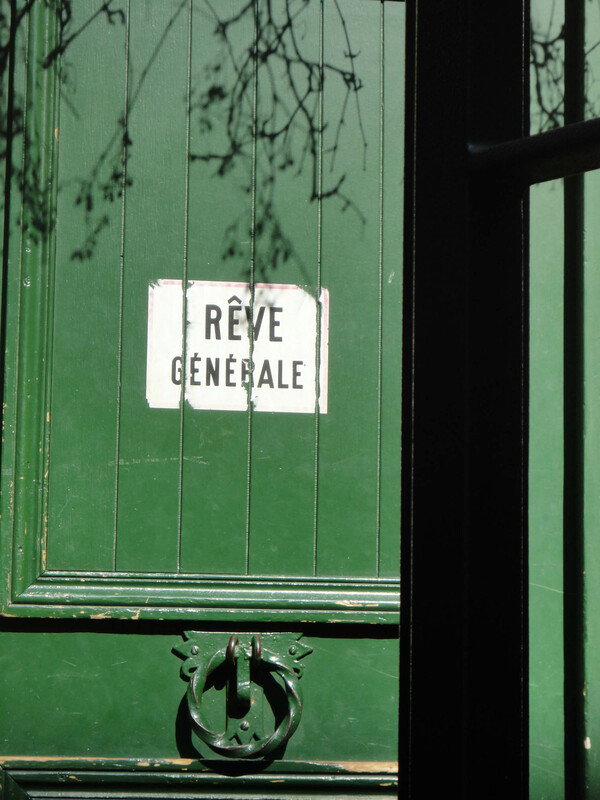 Un rêve is masculine, so it would be “Rêve Général” of course . Ah, thanks for that phildange. You’re right: that “e” at the end would be a clue that something isn’t right, I didn’t notice that. Merci pour la correction! Oh, and the duck thing was made for kindergarten ( école maternelle), but this was ages ago, maybe the 50s/60s .The design shows it, and nowadays kids if 5 know as much as kids of 3 in that time . This is too elaborate and too serious for 5 years old of now . Actually this page is in the current school notebook of a girl that I teach English to, who is 5 years old. So I guess they’re still using the old material! Thanks for your comment phildange. I have always heard that Europeans value their food better than we greedy, fat Americans so I’m curious to know if the French actually mistreat their ducks like we do. I only wonder this because I heard an NPR discussion about a farm in upstate NY that has managed to allow their ducks to forage naturally for food and, while it takes longer, the end result still gives a nice (albeit uberexpensive) patè. 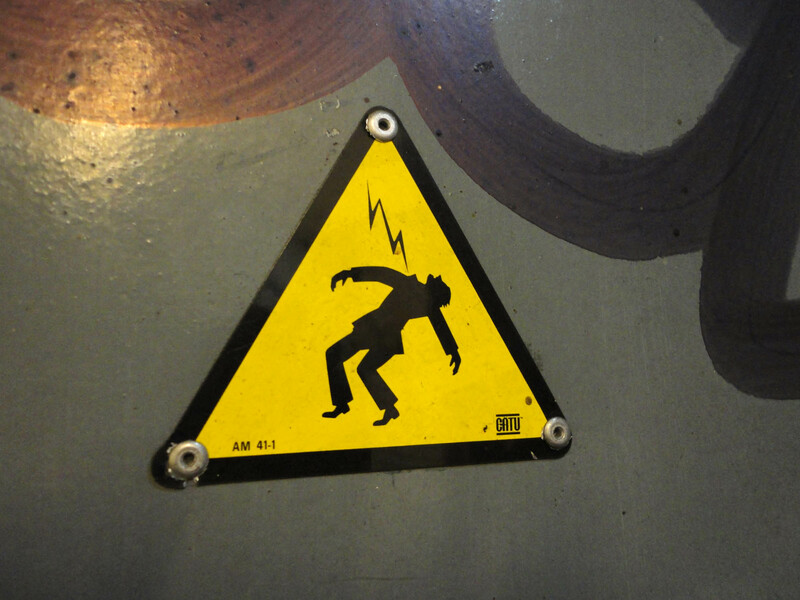 Also, the high voltage warning sign reminded me a lot of Michael Jackson’s “Thriller” dance. There are industrial breeding businesses in France, less than in the USA of course, but there also are a lot of natural breedings . 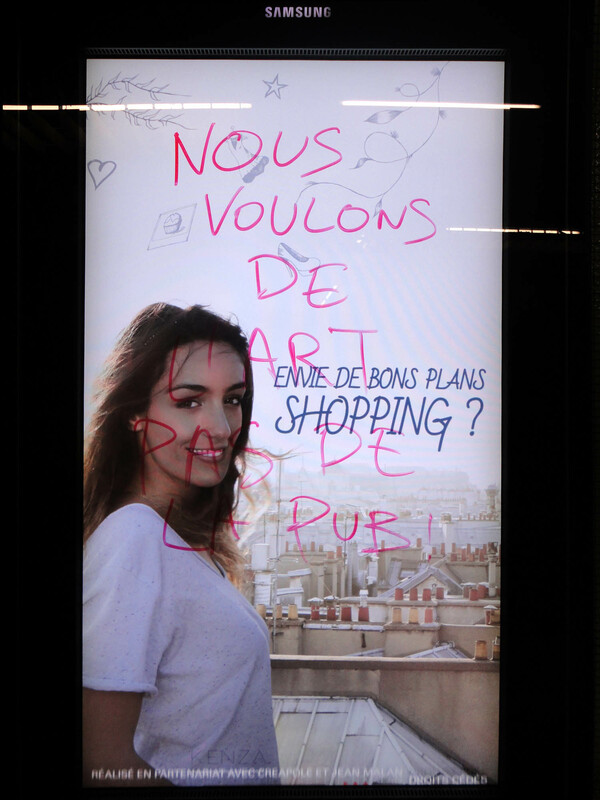 Industrially bred animals are mainly for Parisians and most brainless people like them . French people who still know about life manage to get their ducks and chickens from traditional places . And by the way, I never thought this man being fried by high-voltage was theatrical or stylish in his fall when I was younger. I always fearfully thought that I would get impaled by some sort of thunder. This sign used to scare me a lot. 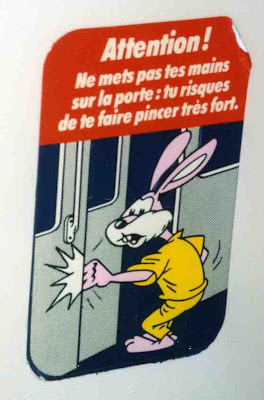 Just like the old sign in the métro of the bunny rabbit pinching his hand in the doors. It wasn’t clear to me at first when I didn’t know how to read that the rabbit’s hand was pinched. I thought it was getting shocked from touching the doors. For years, I didn’t want to touch the doors. And then I learned how to read! Haha that’s hilarious David, I can picture a poor kid thinking the subway doors are going to zap him if he gets too close. I remember being surprised to see the rabbit picture because there’s definitely nothing like that in NY, but from your story I guess we can say it did its job. 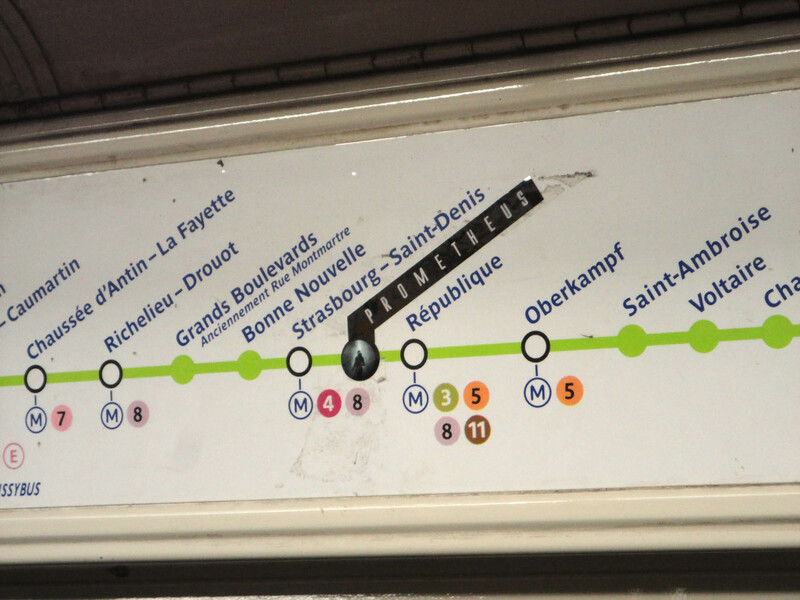 Now that I think of it, I haven’t seen the stickers on the newer trains so maybe they’re being phased out. By the way I’m currently addicted to Youtube cooking vids of Marco Pierre White. With your love of food I assume you’re familiar with him? If not check him out, he’s like a zen master of cuisine. Thanks for the great comment and take care. Yes, they started to get phased out with newer trains early 2000s. It’s too bad. I will check this guy out on YouTube. Thanks for the tip. that yellow sign is indeed an oscar winning performance….. 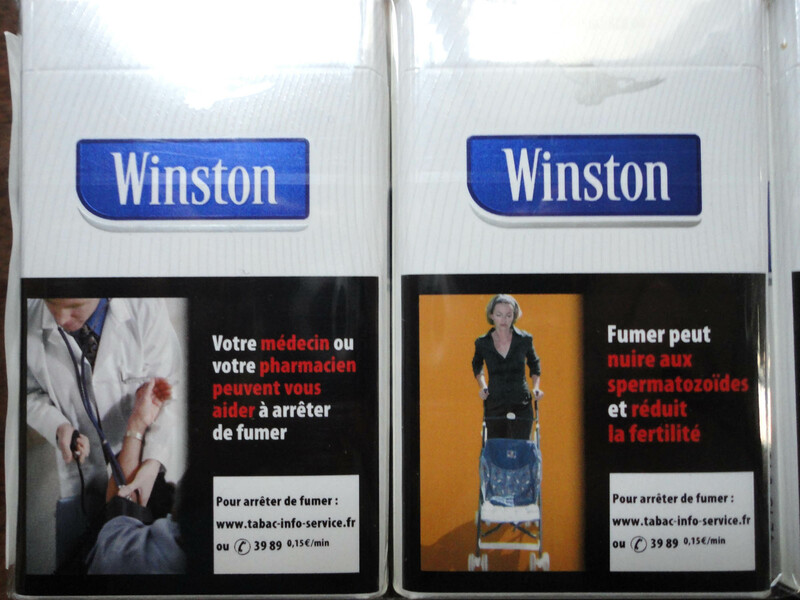 These are actually nice observations, especially with the cigarette labels. I think they should make it more sickly in a way people will be afraid to buy and use them. Thanks, I have to say I agree with you and I have to say it’s hard for me to figure out why people still smoke. I’d also be interested to know if these campaigns manage to reduce smoking at all. I really enjoyed this – I’ve loved finding all of the quirky or different signs around the city, in all different forms. Some of the graffiti around Belleville especially is really great. And I recently saw a pack of cigarettes with a pretty gruesome picture of a man with a growth on his neck. …it made it’s point, let’s say that. Thanks for the comment. 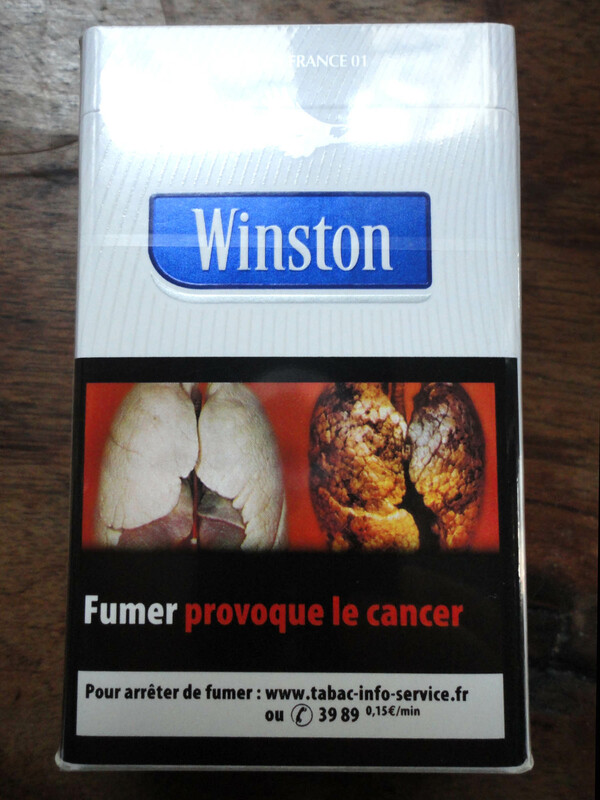 Yeah they’re not shy about slapping those shocking pictures on cigarette packs in France. Marlboro must be thrilled. Corey, your keen eye and even keener wit delight me. “Next was a high-voltage sign proving that in Paris, even when one gets fried with hundreds of thousands of volts, one must do so with style and theatrical flair” literally made me laugh out loud. 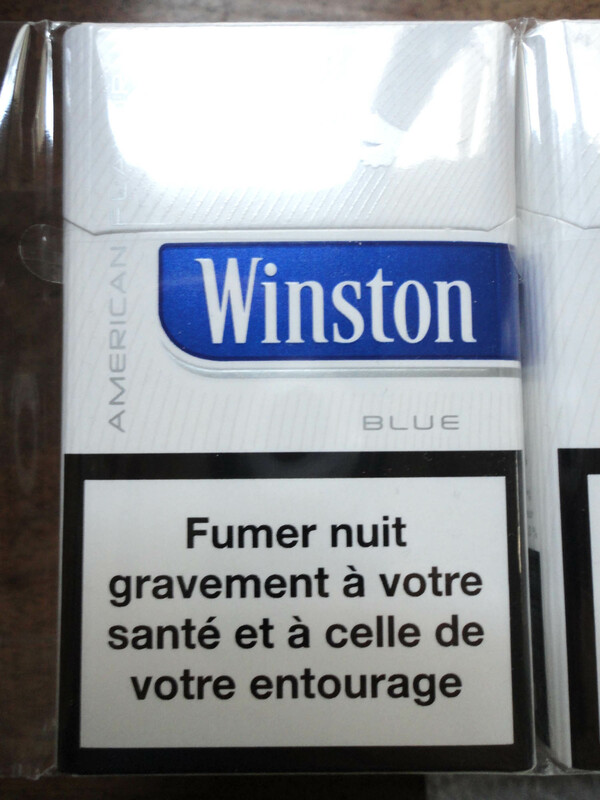 By the way, we have similarly graphic cigarette package warnings here in Canada. 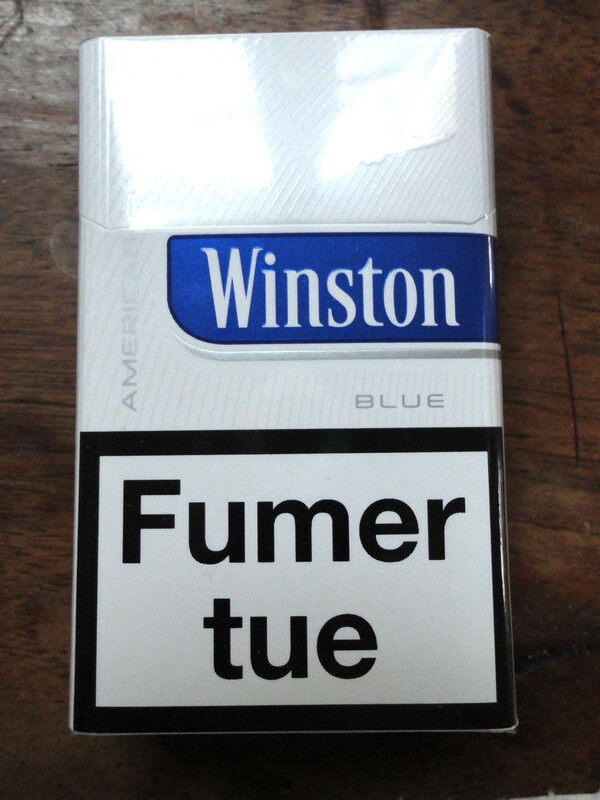 Not sure if it really has any effect on the diehard smokers, though (no pun intended). Thanks Barbara for your comment. Are you still making the magazine?